Clay is the perfect material for capturing time in a bottle. As molecular biologists have discovered by unearthing ancient tombs, organic residue trapped in porous chards of pottery reveals quite a bit about what our ancestors drank on the special occasions of burial feasts. It's interesting that thousands of years ago – in places such as Turkey, China and Central America – these momentous occasions were celebrated with hybrid beverages. These alchemistic mixes incorporated exotic ingredients like saffron and hawthorn fruit with multiple sugar sources like honey, grapes, rice and barley. As often as we look forward and innovate, Dogfish Head has looked backward for inspiration as we explored ancient recipes like Midas Touch, circa 1740 B.C., in Turkey and Chateau Jiahu, circa 7000 B.C., in China. Now we are bringing this hybrid concept into the future with Noble Rot. 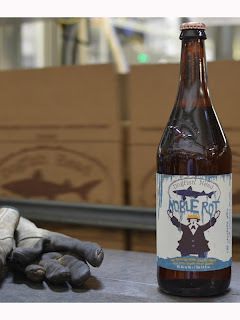 "This is the absolute closest to equal meshing of the wine world and the beer world that's ever been done commercially," says Dogfish Head Founder and President Sam Calagione. For Noble Rot, 49.5% of the fermentable sugars come from grapes, and 50.5% come from grains. Two unique white wine grapes, sourced with our friends at Alexandria Nicole Cellars in Prosser, Wash., add complexity to this saison-esque science project. The first addition is unfermented juice, known as must, from viognier grapes that have been infected with a benevolent fungus called botrytis. This "noble rot" reduces the water content in the grapes while magnifying their sweetness and complexity. The second is pinot gris must intensified by a process called "dropping fruit," where large clusters of grapes are clipped to intensify the quality of those left behind. "It's been fascinating to watch the cross-pollination of wine and beer," says Alexandria Nicole Founder Jarrod Boyle. "We're excited to be involved in this." Noble Rot, which clocks in at 9% ABV, is brewed with pils and wheat malts and fermented with a distinct Belgian yeast strain. It has a spicy white wine body and a dry, tart finish. Noble Rot will be available in 750-ml bottles ($12.99 MSRP) and on draft in the next few weeks. We are very excited to bring a beverage like this into the beer, food and wine worlds simultaneously. Besides, we always wanted to see if a beer with the word "rot" in the name would actually sell.